Welcome to yet another Egyptology Weekend-post, although today is Monday. This time a little info about the jackal-headed god Anubis. Anubis, the jackal-headed god who is found in numerous cartoons, computer-games and horror movies as one of the “bad guys” is actually the complete opposite. Despite his somewhat demonic looks, he was one of the “good guys” in the ancient Egyptian pantheon. The image above is taken at the New Carlsberg Glyptotek in Copenhagen. It is the head of a life-size (human size) statue of Anubis. His head is a jackal and his body is human. One of his main “areas” was, that he was “foremost of the westerners“. Most cemetaries and other cultic buildings associated with death, burial and the afterlife was placed on the western side of the Nile, and thus the westerne side was understood as “the dead’s side”. 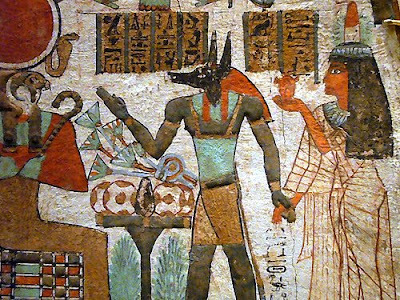 Anubis, as “foremost of the westerners” refers to his “job” as the one who lead the deceased on their way into the netherworld. Above you see Anubis leading a deceased lady. She is dressed in fine, transparent linen and wears an elaborate wig and a perfume-cone on her head. The image is from Metropolitan in New York and has been taken by flickr-user ggnyc. Anubis was also God of Embalming. He was master of the per wabet, which was the ritual tent or pavillion, where the deceased were embalmed. According to myth, it was Anubis who made the mummy – the first mummy – which was that of Osiris who then became ruler of the netherworld and thus he became God of Embalming. 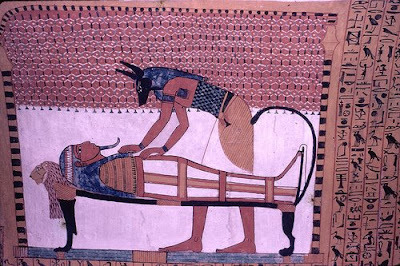 The image above shows Anubis preparing a mummy. The image is a tomb-painting and has been photographed by flickr-user pjwar. Anubis was also guardian of the Necropolis and had a number of other “jobs” that he had to take care of. Anubis is usually depicted as a man with a jackal’s head or as a jackal resting on top of a shrine. 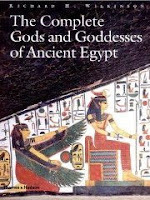 If you want to read more about Egyptian gods and goddesses, I recommend: The Complete Gods and Goddesses of Ancient Egypt by Richard H. Wilkinson, from where I have also taken the long quote in the beginning of this post. Once again, I loved the egyptology! Learned something new! Thanks so much for this. I really love these posts. And I was one of the people who thought Anubis was kind of like the grim reaper! Well written post with great illustrations. I don’t find him ‘demonic’ looking. I think he is rather cute..even with the whole embalming thing..
Great post, Lou! I never knew much about Anubis, glad to know he’s a good guy. I thought the incense cone on the woman’s head was a great mention…I never would have caught that! This is really fascinating. I don’t know much at all about egyptology, so everything was something learned. Fascinating subject! Great post. And I know it takes time to write these really good ones. I can write about Dalgliesh´s name in 10 minutes, but a proper review takes an awful lot of time (and I only get one or two comments for it).